Two-thousand eleven is turning out to be a good year so far! Justin and I are looking forward to the Southern SAWG (Sustainable Working Ag Group) conference in Chattanooga, TN that starts on Thursday of this week. What is even more exciting is the energy and momentum that many of us feel after the Urban Food Visioning Session that took place this last Saturday. First, a big thanks to Holy Trinity Episcopal Church for allowing us to use their space for free! There were about 30 people in attendance and this is THEIR work! As the name suggests, in the gathering our main activity was brainstorming—always a fun thing to do, I think! You can download the results of our brainstorming to read exactly what we came up with. We organized the ideas into 10 categories and gave them “juicy” titles to help us connect more viscerally to these ideas. Broadly speaking our categories spanned from creating online resources and ways to connect folks who want to grow food with places to do that; community education and workshops on all sorts of urban food topics but definitely on how to grow food; finding ways to heal the soil and community in the proposed urban farm location (see post); eating food together; making food more physically accessible; and getting better food into our public schools. The next steps include meeting in committees (or as we prefer to call them, nests) to develop plans to get some things done! If you wanted to participate but were not able to make it, or just didn’t hear about it in time, we still want your participation! Download the brainstorm results and let me know what your interest is. Then I’ll make sure that you are connected with your “nest” of interest to get involved. My goal is to create a listServ to help facilitate discussions and get people DOing! (If any of you have ever set up a listServ, I’d greatly appreciate your assistance! Email me at urbanharvest.gso@gmail.com) As I emphasized in the meeting, Urban Harvest is happy to facilitate, lead, organize, partner, or just help make connections. We realize this is about Greensboro, not about Urban Harvest, and the more people we have empowered and excited about doing something, the more success we can have as an entire community! Thanks to everyone who attended, and for everyone else, we hope to see you next time! For all of you young’ns wanting to get involved in local food this is a great opportunity. The Center for Environmental Farming Systems (CEFS) is seeking highly-motivated undergraduate students from a variety of different backgrounds, with a strong interest in sustainable agriculture, to participate in a unique 8-week summer internship (June 6-July 29, 2011). CEFS summer interns will learn about the concepts and practices of various aspects of sustainable agriculture from expert faculty and staff at CEFS and through hands-on farm work, lectures and discussions, community engagement, and field trips to local farms and markets. Additionally, students will work in pairs with a CEFS faculty mentor to learn about an aspect of sustainable agriculture research. The deadline for applications is Tuesday, March 1, 2011. 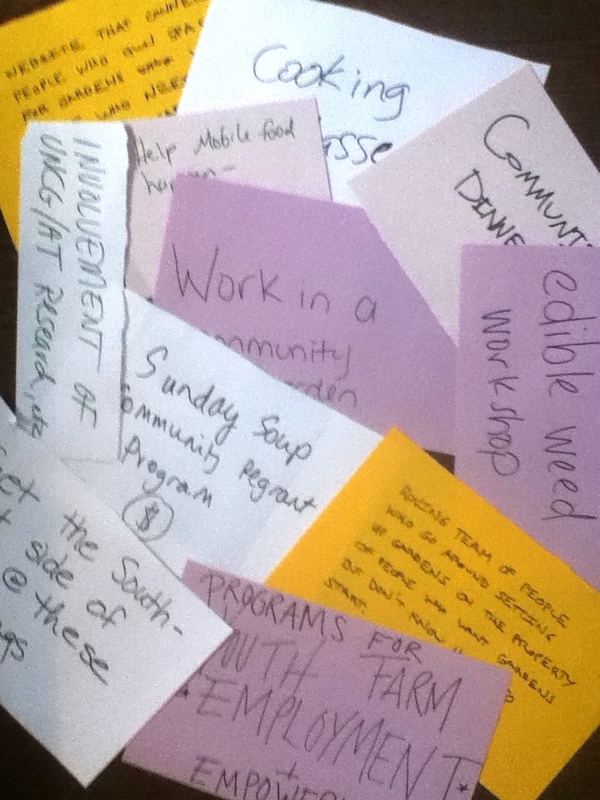 This is why we want to invite you to our first Urban Food Visioning Session. So many of you have expressed interest in getting involved with Urban Harvest, and as you know we are currently an all-volunteer organization. We’ve been successful at small steps and small victories with a small number of people, but we have power in numbers. So we’d like you to join us around the “kitchen table” to tackle something a little larger. Come with your project ideas, and an open mind to others’ project ideas, and we’ll create an action plan to forge a greener, healthier Greensboro! Since this will be a “kitchen table” session, plan to eat with us! OK, we’ve had our first couple of frosts and a long Thanksgiving holiday. Work in the garden has slowed quite a bit. Perhaps we can take a moment for a bit of a debate around the fire? Or more simply put for the purposes of this blog: which route is the better one to take – Local or Organic? Of course, the ideal answer to that question is BOTH! But what about those times when you really do need to make a choice? Not many of us here in the Piedmont are growing our own wheat for bread, for example, and our seafood, though kinda local (regional really), mostly gets here from the coast. Thanksgiving at my house included lots of locally raised and organic selections, but not all were, by any means. So what’s a responsible omnivore to do? Not exactly The Omnivore’s Dilemma (thank you, Michael Pollan!) I know, but a question that seems to keep coming up in our food discussions. As an organization with both sustainable agriculture and urban agriculture at our core, we often find these 2 techniques [sustainable and urban] to sometimes be out of sync with one another. The primary concern I have with the majority of urban ag out there, is the quality of the soil. (ie. Can it be sustainable if we often need to purchase compost/manure? If we don’t bring in new healthy soil, are we able to produce food in a healthy and sustainable way?) Growing food is great, and necessary for sustainability, but if you’re growing in contaminated soil, you create other problems, and that is not a sustainable solution. Healthy soil is most essential ingredient to the work we do, and to our civilization as a whole. If cities are to become more sustainable, healing the soil has to be a priority. And if urban agriculture is to be truly sustainable, it too has to be based on healthy soils. So this new pollution cleanup technique should be integrated to any urban ag system as well as all municipal water treatments. This is will lead to more sustainable and healthy urban agriculture. As many of you know, our main project thus far has been at the Dunleith Community Garden in the Aycock neighborhood. The garden was installed in June of 2009, and since then we’ve had 2 successful seasons of CSAs (community supported agriculture) and 7 neighbors renting plots. Well, when it comes to the garden, the time to think about spring is in the fall! We’ve got some winter “cash crops” (edibles) in the ground, as well as some winter “cover crops” (to help improve the soil). 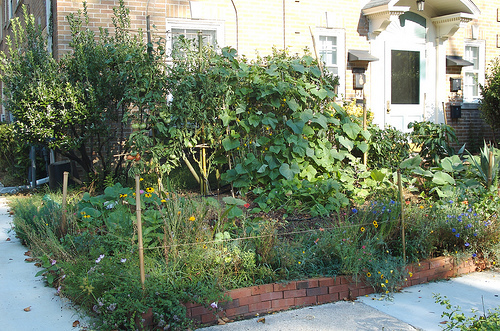 This fall, we are opening the garden up for more folks to rent a plot in the spring. In the past we have offered the option of participating in the garden through a CSA or by renting a plot. This year, we hope to fill up more of the garden with plot renters, and from there determine whether or not we will run a CSA. After all, it is a community garden, and we want our community to have ownership. A community plot rental is a small financial investment but a large time commitment. Plot rentals give you 10 months to tend your own community plot. 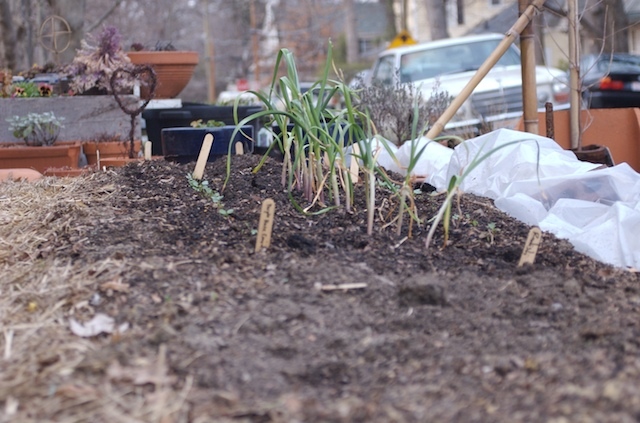 Spring plots will be available Feb 1, 2011 for you to prep and plant those super early spring crops (like snow peas)! If you are interested in renting a plot at the Dunleith Community Garden, please send an email to urbanharvest.gso@gmail.com and we well send you a sign-up form. Now that fall is finally here, I think I can rest a little! As far as I can tell we had a very successful Summer/Fall CSA with 7 subscribers. I can tell you, they are probably also relieved to not have to deal with several pounds of eggplants every single week! 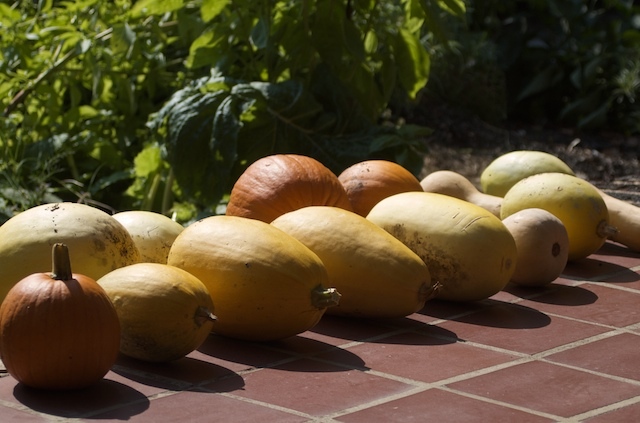 We also were successful with many kinds of sweet and hot peppers, okra, cucumbers, watermelons and winter squashes (pumpkins, spaghetti and butternut squash) in the hotter months. Despite the fact that hot weather lasted well into September, we were also able to provide broccoli raab and hakuri turnips, a gourmet salad mix with lettuces, arugula and early mustard greens.